Category Archives for "Neck Pain"
With Chronic neck pain, you can quite often have tightness in your sternocleidomastoid muscle due to sitting or doing activities with less than ideal posture. Start by placing the inside part of the hand below the thumb firmly on your collar bone called your clavicle and your Manubrium (the part just inside to the collar bone. Then keeping your chin tucked in, look upwards, tilt your ear away from the shoulder and turn your head toward that left side while maintaining your gaze upwards. Hold this beautiful stretch for 30 seconds and repeat it 3 times for each side twice per day. With Chronic neck stiffness, you may actually have a stiff first rib due to a tight anterior scalene muscle. This can be caused by old trauma, stress or bad posture from sitting. Start by placing the inside part of the hand below the thumb firmly above your collar bone and over the first rib. Then take a big breath in, keep your chin tucked, look upwards slightly and tilt your ear away from the shoulder. Don’t forget to exhale and just keep breathing in and out normally while holding this stretch for 30 seconds. Repeat it 3 times for each side twice per day. So our next exercise will talk about mobility for the neck, particularly with rotation. Quite often when the neck is very stiff, it can be quite uncomfortable to turn so I find that just simply giving your hand around your neck a bit of a tug there to help it support. You’re guiding the neck a bit through the range. So you start off here and you turn into a comfortable position. 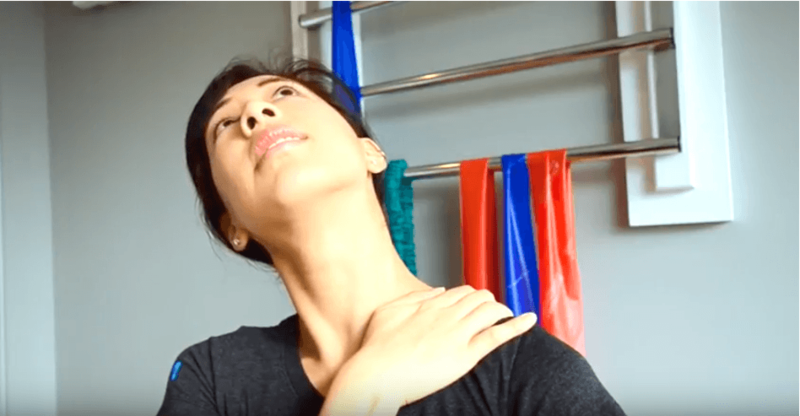 You can feel a bit of a discomfort on the end or a bit of stiffness between the shoulder blades or even in the side muscles of the neck like your traps and that’s completely fine. I would start off doing this 5 to 6 times, 5 to 6 times a day. So you want to just get more frequency throughout the day, and as you get better you can up your sets and reps. But it’s quite simple; you place your hands across here and then turn this way. In case of shoulder pain where you’re unable to reach across, you can still use the same side. The whole idea is that you want to rotate to a comfortable position. It’s ok to hit a bit of a barrier or a bit of discomfort and work your way back to the centre. This next exercise is a mobility exercise that I generally use for upper quarter complaints. So that would be a stiff neck, stiff shoulder or stiff mid -back. It should be done comfortably several times per day. I usually start with 5 reps 5 times a day and then work my way up. You can experience a bit of discomfort or pain and I’ll demonstrate the exercise right now. So you simply point your thumbs up and you just want to move through a fews reps of this throughout the day. You might experience a tinge of discomfort or a tinge of pinching in the mid back for example. That would be very very normal especially in the early cases of acute onset of neck pain or mid back pain. It can be quite helpful even after a car accident where everything seems to seize up a bit. So Again, it’s a very simple motion up and down and you can experience a bit of discomfort and that’s completely fine. I would do it several times a day. Start with 5 reps of 5 sets and then work your way up from there. So our next exercise is a range in motion mobility exercise. This is a great exercise after car accidents if your neck is a bit sore, if your upper back or shoulder blades are a bit sore. And this is something we usually say to do a few times a day for maybe 5 to 10 or up to 15 repetitions at a time. So this one can be done either sitting or standing, whatever’s the most comfortable and functional for you. And the set-up is quite simple. Start by crossing your arms comfortably in any position that you like. And then just actively turning your body to one side til you hit a bit of a barrier of some kind, and then come back. So this can be a bit sore, a bit stiff and you’re very much allowed to just bump into that. And then you might want to turn to the other side, touch a bit of a barrier and then come back. And so I would repeat that anywhere from 5 to 15 times, 3 times per day to start with. Today’s exercise will give you a pain-free way to regain mobility in your neck, particularly in neck extension (looking up). 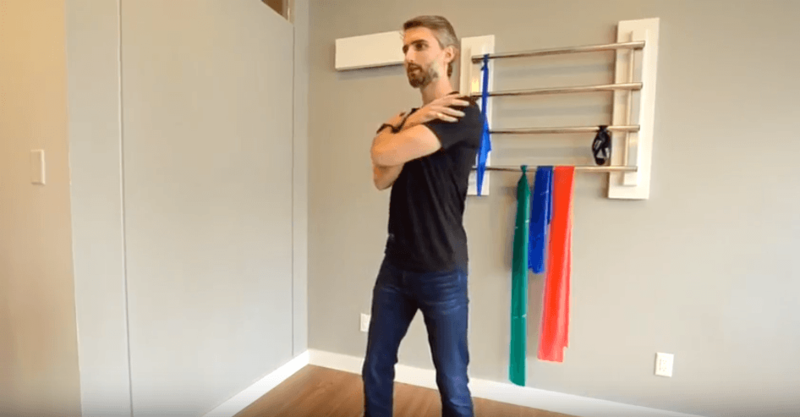 The goal of this exercise is to allow you to either maintain the mobility in your neck after you see your physiotherapist or when you find that the extension motion is limited. 1) Find the right spot. Locate the fold in the bottom of your neck when you look up. 2) Use the edge of an unrolled towel pulling towards the direction of your eyes. 3) This exercise has to be 100% pain-free so maintain the direction of pull with your towel during the motion. 4) Start by pulling the towel towards the level of your eyes. Sustain this pull and look up. 5) Complete this 3 times for 3-5 second holds daily. Remember, you should feel NO PAIN during this exercise. If you find it painful, try modifying the angle of pull to find a pain-free zone. If you cannot find a pain-free zone, then do not perform this exercise and contact your treating therapist.